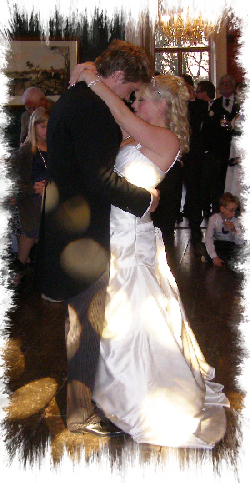 JMF Disco provides experienced Wedding DJs in Warlingham to help with your special day. Our aim is to provide you with all the help you need, from your initial phone call to seeing your happy guests leaving after a wonderful nights wedding entertainment, at your perfect reception provided by your Wedding DJ Warlingham. Call or email JMF Disco for your Wedding Disco in Warlingham to find out how I can help you. Have a look at the Weddings page for more details of the Wedding DJ Warlingham service I offer and call me to discuss how I can help make your evening very special. I like to provide my clients with that little bit more - I provide them with what they want, need and deserve for their reception - it is a special occasion and should be treated as such. Doing it right requires a Wedding DJ with the right skills and resources. Our Wedding DJs will bring that to wedding receptions in Warlingham, playing your favourite music from your planned wedding dj playlist. Set at the end of a mile long driveway, in 350 acres of Surreys breath taking countryside, Farleigh Golf Club offers a variety of suites suitable from intimate weddings of 30 guests to a wonderful suite with direct access onto pretty patios which can cater for up to 160 for a wedding breakfast. The clubhouse is an excellent venue for parties, wedding receptions and business event, that can accomodate 150 seated guests or 200 guests for an informal event. Warlingham Sports Club has a recently refurbished hall adjacent to the club that is available for hire for your party or celebration. - I'm sure I can provide you with the Wedding DJ in Warlingham you really want!